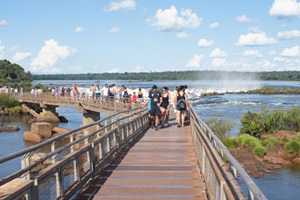 The city of Foz do Iguassu (Mouth of the Iguassu River) is located in the Brazilian State of Paraná on the border with Argentina and Paraguay, and is situated within the Mata Atlântica biome. Foz do Iguassu is the gateway to Iguassu Falls, one of the most famous attractions in all of Brazil and among the most captivating natural wonders in the world. 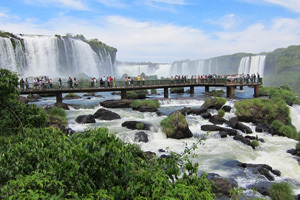 The 275 massive waterfalls are divided between Argentina and Brazil, with viewing platforms and elevated walkways allowing visitors to venture out over the water experience the power of the falls up close. Water isn’t the only thing to see in the "Land of the Falls"; visitors can revel in the splendor of the surrounding forests, observe the many species of birds and other wildlife, and see the world's largest hydroelectric work, the Itaipu Dam. Our trip begins at the National Park Visitor's Centre where we board a shuttle for a drive through the lush subtropical vegetation of the park en route to the falls. Stroll down the trail that descends the canyon offering a panoramic view of more than 240 different falls. Penetrate the mist of the Devil's Throat on the main walkway. Take the glass elevator up the cliff face for a view from the upper deck. The National Park along with its “sister” park in Argentina is home to the most significant remaining rainforest in the Southern Cone, which together with the cataracts has been declared a National Heritage Site by UNESCO. Cross the Tancredo Neves Bridge with its lovely view of the Canyon en route to the Iguazú National Park in Argentina. Visit the upper walkways which allow a different perspective and more intimate contact with the falls and adjoining rainforest filled with orchids, bromeliads, birds and other wildlife. The highlight of the trip is a visit to the suspended platform at the very brink of the Devil's Throat - the largest of all the waterfalls at Iguassu. 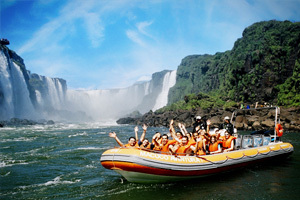 Also in Brazil’s Iguassu National Park, one can find the Macuco Boat Safari. This begins with a trip in an open van accompanied by a specialized guide. Ride 2 km into the forest at a reduced speed, learning about the native flora and fauna. On completing this stretch, we continue on foot to the margins of the river where a specially equipped motor boat takes visitors on one of the most moving trips, where they have a close-up view of the falls, hear the thunder of the water, and get wet in the mist of the falls. Unforgettable! Visitors who take the Macuco Safari Excursion have the option of descending through the rapids downstream from the falls in inflatabale boats propelled by oars and captained by licensed professions associated with the Brazilian Confederation of Canoeing. The rafting portion has a duration of 30 minutes and is an optional addition to the Macuco Safari. Visitors who opt for the rafting descent are instructed by the coordinators of the operation while still on the jetty and receive all the necessary equipment (special life-jackets and a helmet). 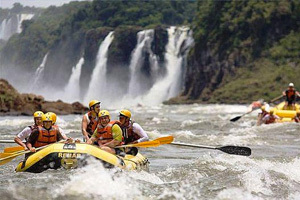 Following this, all passengers embark together in the conventional boats and take the normal safari route, including the baptism in the Three Musketeers Falls. On the return trip, in a calmer area near San Martin Island, passengers who opt for the rafting portion are transferred to the rafting boat to begin their descent through the rapids. 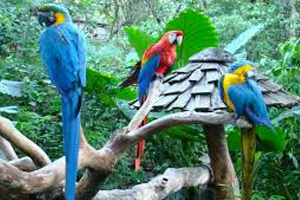 The Bird Park (Parque das Aves) is conveniently located at the entrance to Iguassu National Park and is fully integrated into its natural surroundings. Mingle with and photograph hundreds of different native and exotic birds, snakes, caimans, marmosets and butterflies in spacious walkthrough aviaries and trails that wind through the jungle. This visit to the largest Hydroelectric Dam in the world begins at the Reception Centre where an audiovisual presentation is shown highlighting the history of the construction. We then visit the power station and observation deck with a panoramic view of the entire dam and the spillway, giving an idea of the dimension of this colossal project. 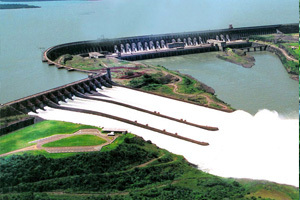 The Itaipu Dam is eight kilometres long with a total of 20 turbines and an installed capacity of 14,000,000 kilowatts. Note: Special technical visits may be arranged upon request. 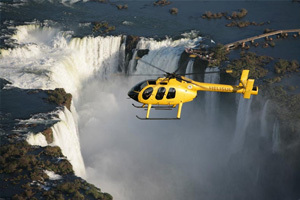 Thrilling and informative, a helicopter flight affords a completely different perspective of the waterfalls. Optional longer flight includes the three borders, the cataracts and Itaipu Dam. After crossing the picturesque Friendship Bridge, you reach Ciudad Del Este, Paraguay. 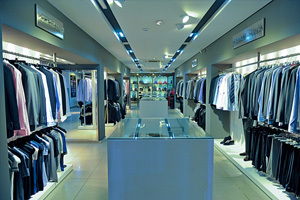 There is plenty of time for duty-free imported goods and local handicrafts. Accompanied by guide. Passport or valid I.D. is requested for this tour. 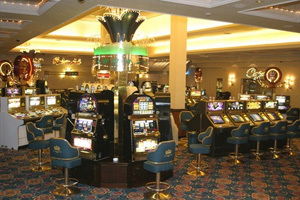 Enjoy all the classic games like roulette, blackjack, baccarat and slot machines. Special private poker games available. Complete bar service and cabaret style show in the annex.